Left unable to reach the choir loft of their new chapel after no carpenter would take on the impossible task of building a staircase, the Sisters of Loretto prayed a novena to Saint Joseph. On the final day, a mysterious man showed up and completed the task in total seclusion, leaving 8 months later without a trace. The carpenter of Nazareth himself is traditionally attributed with the creation of the “miraculous” staircase of the Loretto Chapel. Loretto chapel, convent, and academy in Sante Fe, 1904. In 1879, the architect Projectus Mouly unexpectedly died, leaving a nearly complete chapel save for one glaring predicament: there was no way to access the choir loft twenty feet above. The sisters brought in many carpenters, but all determined that the only solution would be to use a ladder or tear it down and build it anew. Unwilling to make such a hasty decision, the Sisters of Loretto prayed a novena dedicated to Saint Joseph. On the ninth and final day, a grey-haired man arrived at their convent riding a donkey, asking Mother Magdalen for permission that he may build the staircase for them but he would require total privacy. The mysterious man had only basic carpentry hand tools to work with, and eight months later disappeared without a trace leaving behind, except a beautiful work of art. The Staircase of Saint Joseph at Loretto Chapel. The “miraculous” spiral staircase is renowned for being unusually helix shaped, rising twenty feet high with no internal support holding it up. The stringers are perfectly curved throughout two complete 360° turns, each piece fitted with the utmost precision, and built with no nails but simple wooden pegs. Constructed of an unidentified wood not native to New Mexico of unknown origin, master carpenters today have described it as inexplicable “mind-boggling” work. 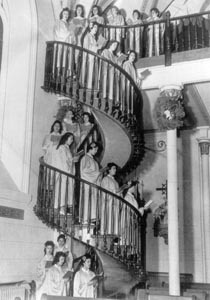 The Sisters of Loretto gathered standing on the Staircase of Saint Joseph. The Sisters of Loretto ran newspaper advertisements in search of the man so they could thank him – even offering a reward for his identity, but it was never claimed. The Sisters of Loretto knew the staircase was Saint Joseph’s answer to their fervent prayers, with some convinced they were constructed by the carpenter of Nazareth himself. Today, the construction of the staircase at the Loretto Chapel is traditionally attributed to Saint Joseph. 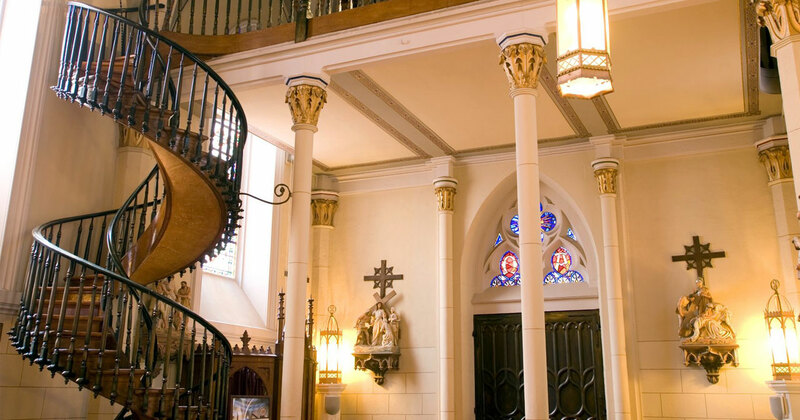 After the Loretto Chapel closed in 1968, it became a private museum used today as a wedding chapel. Get our inspiring content delivered to your inbox every morning - FREE! "Billy Ryan is a student at The University of Akron studying biochemistry. After graduation, he plans to attend medical school."